By the time you read this, you will have already seen some spectacular photographs of the eclipse. Good. Because you won’t find them here although this shot of the totality taken by my husband Mark is pretty awesome. It’s what we saw but not all of what we saw. All in all though, the research we did about taking photos of the eclipse on our iPhones proved to be right. Unless you got incredibly lucky, had some special skill sets and filters, knew how to adjust the ISO and other techie doodads, your pictures would be grainy, the sun small and unimpressive. In other words, nothing like the eclipse we would be seeing with our own eyes. Relax and watch the eclipse, most of the articles advised. 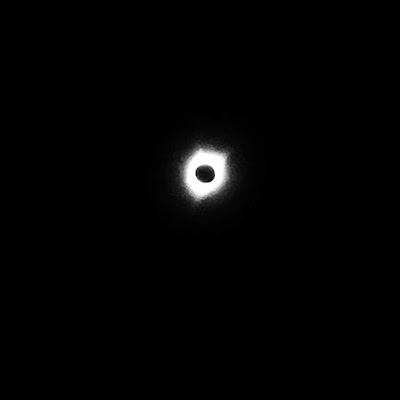 After all, maxxing out at about two minutes, the totality itself wasn’t going to last that long. And while there’s another eclipse coming to the eastern states in 2024, for most of us, this would be a once in a life time event. For someone like me, a rank amateur who loves taking pictures with my iPhone, it was difficult, a bit like the ‘if a tree falls in the forest and no one is around to hear it’ conundrum. If we didn’t take pictures of the eclipse, did we actually see it? After driving up from L.A. for the big event, we left our Washington motel for the two and a half hour trip into the path of the totality about three o’clock in the morning. While we’re not the camping type—the last time I’d slept in a tent was when my now 24 year old son was a cub scout and I swore never again—like good scouts, we were prepared. We’d packed instant oatmeal, bananas, BelVita blueberry breakfast biscuits. Instant coffee. Plus one of those travel pots you can plug into your car’s lighter to boil water. We had pillows and blankets to sleep in the car for a few hours while we waited for big show. Close enough to camping for me. Driving through the early morning darkness in a line of cars and campers, we were heading to Long Creek, Oregon, a tiny town within the path of totality. Situated down in a clearing, no super tall trees or mountains to block our view, it seemed like our best option until we almost drove by an even better option, about eight miles north of town. 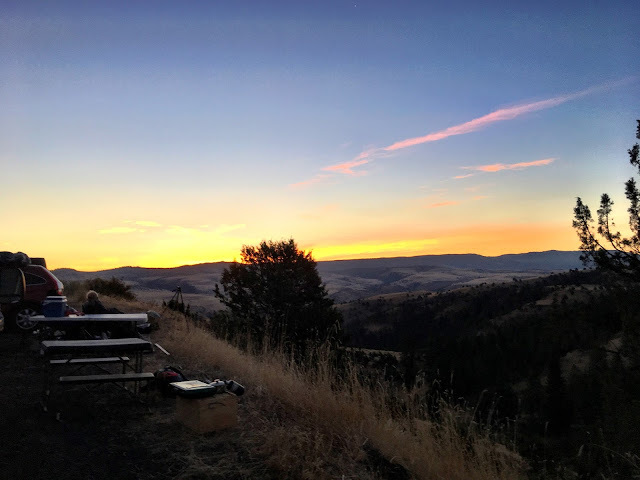 As if we’d made reservations, there on an overlook high on an east-facing hillside, amidst a couple of dozen parked cars and campers, was a space just waiting for us. ‘‘Grab it!’’ I told my husband, but he was already turning in, maneuvering into the empty spot. It was five thirty in the morning and most people were still asleep. In the space to our right, figures were snuggled down in one large sleeping bag under the stars, confident their fellow eclipse watchers wouldn’t touch the scattering of objects surrounding them; a cooler, outdoor chairs, some kind of a bucket, miscellaneous camping gear and cooking equipment silhouetted in the early morning darkness. Mark and I put our seats back, adjusted our bed pillows behind our heads and tried to nap. I couldn’t. While Mark gently snored, I watched an elderly man come out of a camper a few spaces to our left. Coffee in hand, he pulled up his canvas camp chair and sat facing the east, waiting for the sun to rise. I twisted in my seat, closed my eyes but I was too restless to sleep. I realized I didn’t want to miss the sunrise either. Coffee sounded good but then I’d really need to use the bathroom. As I watched another man taking an early morning walk past the car, I wondered if he was in search of a john. The overlook was an unofficial campsite at best, there were no facilities, no Port-a-Potty’s around. I cursed the man crunching the gravel as he passed, fighting my own urge to go. A few minutes later, seeing the glow beginning to rise in the east, I got out of the car as quietly as I could and took a picture of the sun slowing coming up over the hill. As I got back in the car, the family to our right was waking too. ‘‘Do you need to go potty?’’ a woman was asking a small, sleepy child. Don’t remind me! I thought, shifting in my seat, trying to put my impatient bladder out of my head. I’d denied myself coffee in an attempt to keep those meddlesome needs at bay. Seeking distraction, I got back out of the car again, opened the trunk and dug out our own canvas folding chairs. Facing the hillside to the east, the pale grass covered hills the color of golden wheat, dotted with trees and a small herd of cattle I could imagine cowboys riding round the bend. Cowboys, I thought, could just hop off their horses, aim and shoot. No one to care, no one to see. Behind us, I watched as one woman after another, her husband or partner in tow, wandered across the highway into a small grove of trees and bushes and reemerging a few moments later. I had a feeling they weren’t just out exploring and wondered when the hell my own husband would wake up. When the mom to the right told her kids—in a nice, clear, very audible sing song voice—that Daddy was going to make eggs for breakfast, I plead guilty to secretly hoping it would disturb my husband’s rest. Wake up! Wake up! I wanted to scream. He finally came to about 8 am by which time I’d already asked the mom to our right what she was doing for a potty. “We bought a bucket,’’ she said, and I knew I better find a bush fast. I grabbed Mark and made him walk across the highway with me to keep watch as another woman, about my age, was coming out from behind the bushes. “Lots of safe hiding places back there,’’ she said with a laugh as we passed. Phew! Now I could relax and enjoy a morning cup of coffee. I doled out the Folgers crystals in a couple of cups while Mark filled the travel kettle and plugged it in. When the kettle failed to work—much like my iPhone camera app—the daddy next door offered to boil water for us on their camp stove. Meanwhile, the father and son team parked to our left bickered good-naturedly about how best to capture the eclipse on their high end cameras, their technical talk about apertures and f-stops way beyond me. ‘‘I can’t believe I forgot my tripod’’ I heard the son say to his father while watching Mark set up his own tripod for his iPhone. My own iPhone was now completely dead, my ability not equal to the task anyway, offering our new neighbors our other tripod seemed like the thing to do. And then we all sat and waited for the eclipse. 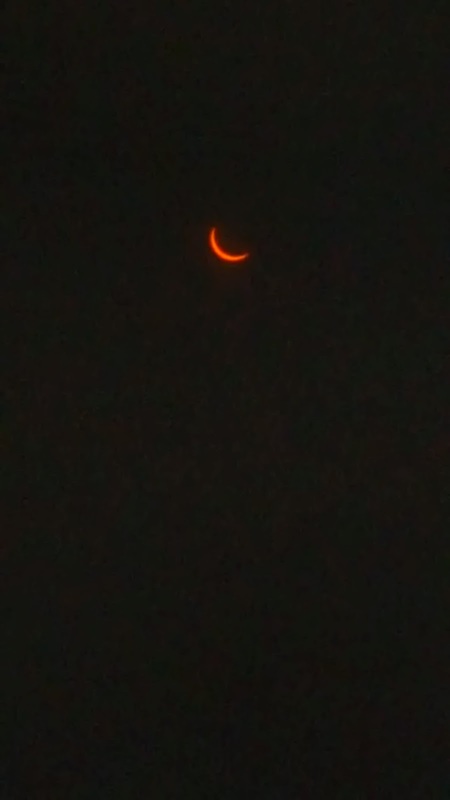 ‘‘Look!’’ we cried to each other during the hour the moon’s shadow traveled past the sun “look at it now!’’And we’d all grab our solar glasses. “Ooh, wow! That’s amazing!’’ similar words were heard up and down the row of our fellow eclipse watchers. Breakfast behind him, the dad to our right—we never exchanged names—managed to catch some gorgeous pictures of the sun disappearing slice by slice. Whether you were there or whether you saw it on television, you already know how truly awesome it was to see. Witnessing the sun morph from a bright yellow circle blazing in the sky into an orange slice and then to a flame colored sliver, finally dwindling down to a fiery filament that shriveled away to nothing as we all watched and oohed—that’s it, that’s it, there it goes, oh my God!—was thrilling. When the sun was completely covered by the moon’s shadow and it was safe to remove the solar glasses we saw a black disk in the sky, a dark circular void surrounded by a silvery white shimmering circle. Below the sky, the pale golden hillside was now shrouded in shadow. The moment really was akin to magic; like something out of a movie. It was easy to see how less advanced peoples would have trembled at its sight while we more educated societies knew it was all just a question of science. Still, staring at the eclipsed sun, it barely looked real. It was more like an artist’s painting in the sky, a painting that might have caused even an agnostic like me to ponder just for a moment, who exactly, was holding the paintbrush? The dad to our right texted me his photo (above) and I still didn’t catch his name. The dad and son to our left promised to email me a few photographs too. I hope they do, I’d love to see if they caught what we saw. But it really is okay if they don’t. I’ll always remember what I saw with my own eyes. We were there. C' est magnifique ! Thanks to share your feelings and also your nice pictures of this wonder of nature. I lived the same event in Lyon ( august 1999 ): It was awesome ! Enjoy yourself in the U.S.A. Have a nice day Sim. Philippe ( a faithful follower of Dreaming of france blogpost from Paulita Kincer).